I love beading and I love teaching. If you’re looking for an upbeat, creative and enjoyable time, you just might find it here. Not an “artsy” person? Surprise yourself. Join one of my classes and see how easy it is to make something beautiful. You can also organize your own class — either a private one-on-one lesson or get a group of friends together and I’ll bring the class to you. Make it a gals’ night out, an afternoon break or a weekend bead party. More classes are added as the mood strikes. If you’d like to register for a class or want more information, give me a shout — there’s a contact form at the bottom of this page. Beading involves close-up work — if you need glasses for reading you’ll need them for beading. A good beading light is also helpful if you have one, along with an extension cord. Stitch glass pearls and fire-polished Czech beads into an eye-catching bracelet, then finish it with an easy-on, easy-off clasp. Several colours to choose from. Learn: How to do triangle weave stitch, how to attach a clasp. 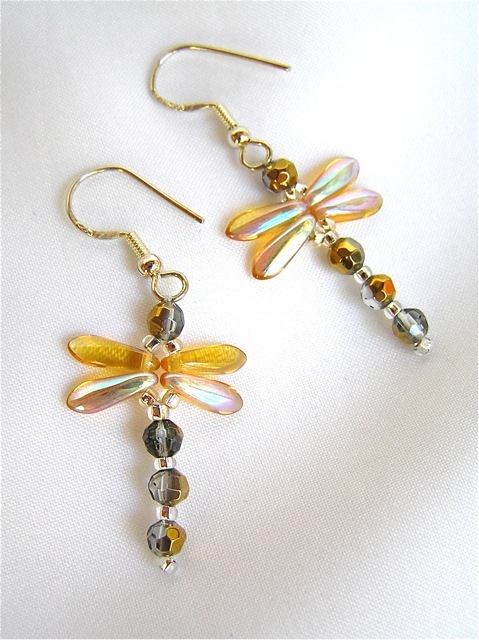 Learn: How to choose beads, use head pins and jump rings, and attach ear wires. 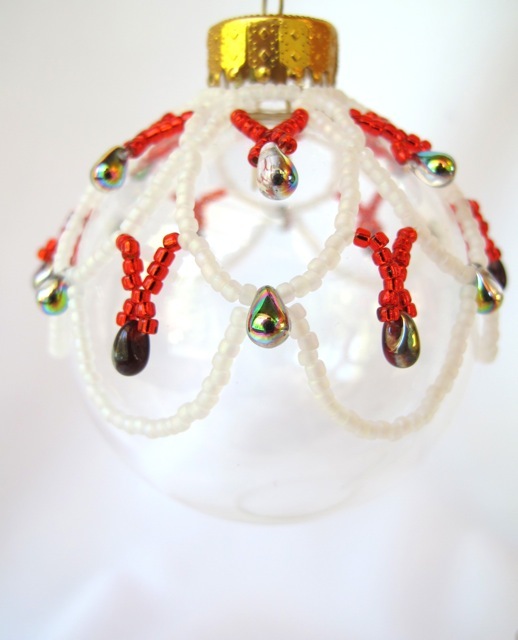 Bead an ornament cover for a clear or coloured glass ball (supplied). Makes a special gift for the holiday tree. Or hang it in a window to catch the light. Several colours to choose from. Learn: Simple circular netting, how to start/end a thread. Nothing says sparkle like authentic Swarovski crystals. This beautiful necklace is sure to win you compliments each time you wear it. Several colours to choose from. Precision-cut Swarovski crystals and Swarovski crystal pearls add sparkle and shine to every occasion. Several colours to choose from. Dagger and faceted beads capture the vibrant shimmer of these winged beauties. Several colours to choose from. Eye-catching dream catchers. Change the thread or bead colours and create your own designs. The stitch uses small seed beads (11’s) so good eyesight is important. Several colours to choose from. Click this link for another variation. You’ll also find another version here. This builds on the previous class. Varying thread and bead colour and the type of dangle gives lots of room for creativity. The stitch uses tiny seed beads (15’s) so good eyesight is a must. Several colours to choose from. You can also add embellishments like these. 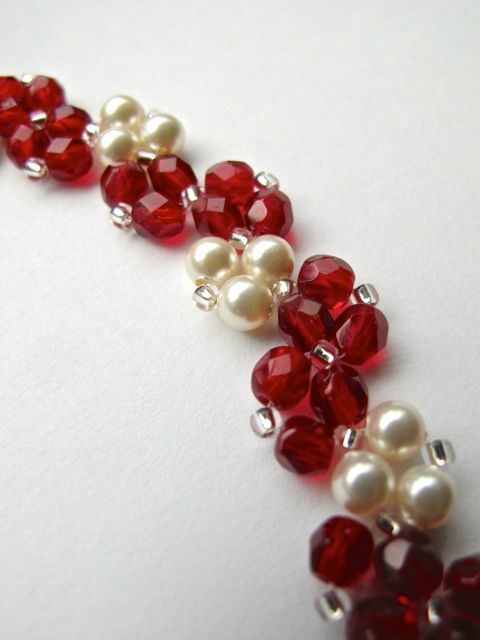 This bracelet can be made in either size 11 or 15 beads. (The smaller 15’s give a daintier look but good eyesight is a must.) Several colours to choose from. Click this link for another variation of this stitch. Click this link to see different colours. This is a surprisingly versatile stitch. Change the colour and placement of the beads and you create quite different looks. Several colours to choose from.